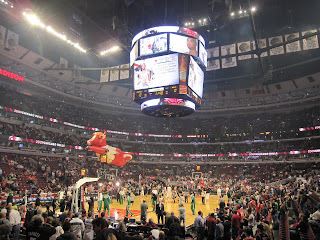 Last night I made my first trip out to the United Center to watch a Bulls home game. If you're a Bulls fan and you missed last night's game, you should be ashamed of yourself! Upon arriving to the United Center, I didn't see any scalpers outside so I went ahead to the ticket window and picked up the best ticket they had. 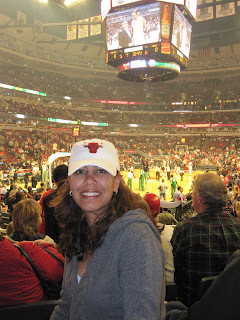 When I entered the arena, I decided to look for a Bulls hat and had my heart set on getting a red one, especially since I was wearing my green Masters hat and realized it appeared as though I was rooting for the Celtics. 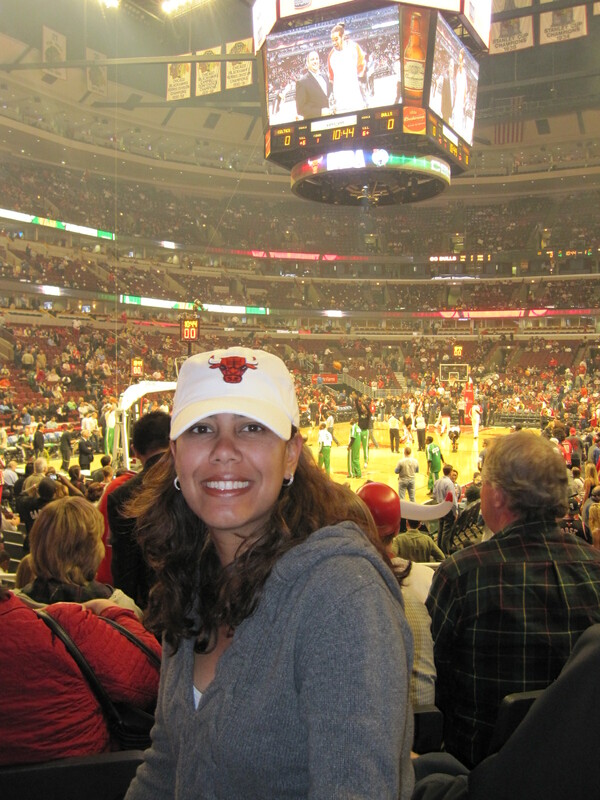 Whoever is in charge of Bulls merchandise needs to recognize that it's an unwise decision to only offer the fitted red hats with the simple Bulls logo. It's even dumber to only offer those fitted red hats in the size XL. Good luck trying to move those hats. **** I settled on an adjustable white hat. Can anyone tell me why there seemed to be a carnival theme on the concourse? I saw a lip reader, a man with a rubber duck, and a magician out on the concourse. I didn't make a full lap, but I can only image what else I missed. The bands playing on the concourse were great, and the people that stood to listed to them play definitely enjoyed the sound. 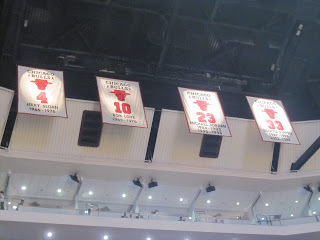 When I sat in my seat, the first thing I did was look towards the rafters. 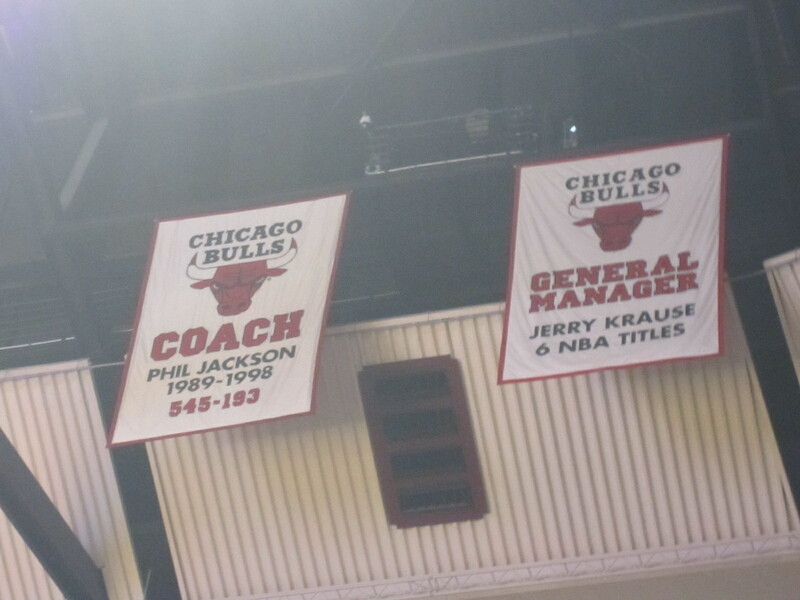 Here are the banners that interested me. I also noticed a ton of Chicago Blackhawks banners and began to regret not going to Sunday's game. However, there's no way that I would've been able to muster the energy. The Bulls are in a dogfight with the Raptors to keep the 8th and final spot in the playoff race in the East and needed to win. 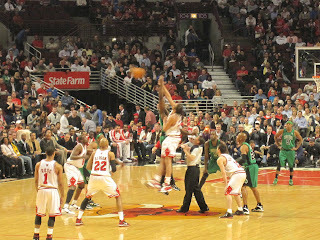 Ultimately the Bulls defeated the Raptors, 101-93. 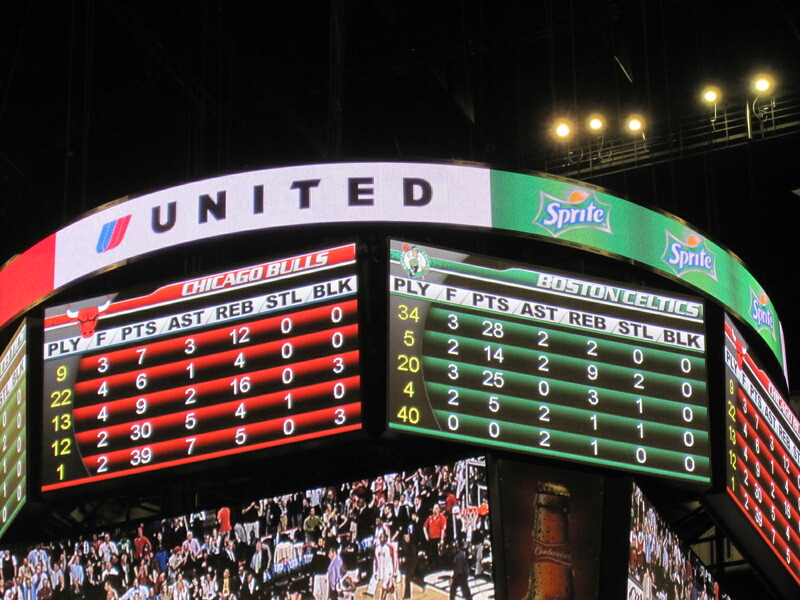 Derrick Rose scored 39 points (i.e. 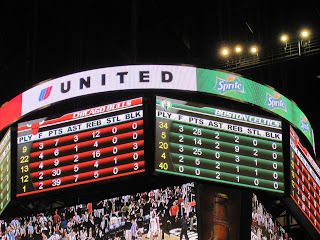 a new career high), and Kirk Hinrich scored 30 points (i.e. season high). 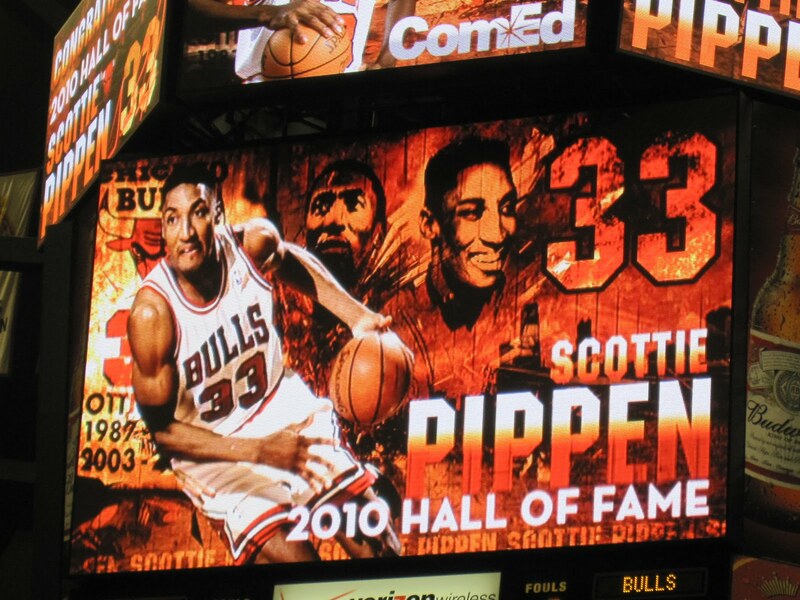 Scottie Pippen was in attendance and received a warm ovation as he was commended on his Hall of Fame induction. 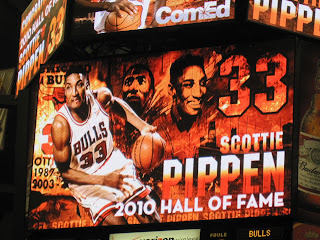 For the half time show, the Bulls had Christopher. I've seen many half time performances, and Christopher's Michael Jackson act is special. If you haven't had the pleasure, here's a clip for you. 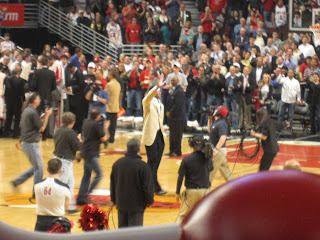 During the game, Rasheed Wallace even helped the Bulls out, when accidentally he scored 2 points for the Bulls when he shot at his own team's bucket. Told you... 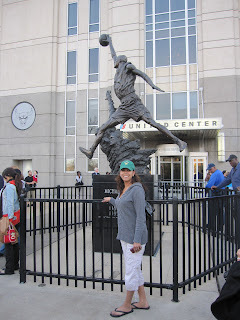 If you are a Bulls fan, you should've been there!